One thing I noticed with this (and all others updates I do) is that they take much time to install. That’s expected if the update needs to be downloaded from the web. But I was wondering why it takes so long even if the files are local? Thanks to a tip (thank you, Marek! ), there is a setting to cut the installation time :-). Anyway, if there are dependency not fulfilled, the setup will detect this in the next step anyway. In my case, with that option disabled, the installation of the Kinetis SDK was down to 3 minutes from the 4 minutes with the option enabled. So ‘checking all the update sites’ was adding up one minute to the installation time. 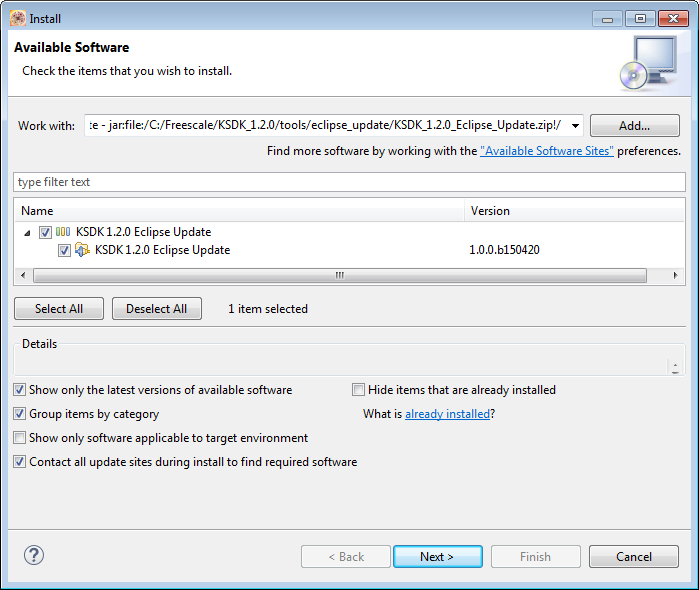 By default, the Eclipse updater is checking and contacting all other update sites. Disabling that option can speed up the installation process. The savings are depending on the number of update sites and the latency of each site. As the update process itself would flag missing dependencies, it is save to disable that option in the dialog. This entry was posted in CodeWarrior, Eclipse, Freescale, KDS, SDK, Tips & Tricks and tagged Eclipse, Tips&Tricks by Erich Styger. Bookmark the permalink.